Thy Hand Hath Provided: Kelley's Lampwork Beads & A Giveaway! Kelley's Lampwork Beads & A Giveaway! This Giveaway is closed. Congratulations, Kim M!! I had so much fun the other day reading about all of you and visiting your blogs. One thing I learned through my visits is that so many of you are extremely talented- whether it be in blog design, photography, cooking, sewing, jewelry making... I could go on and on and on. I was simply amazed. One of my discoveries was Kelley's Bead Studio. Not only does she have an amazing blog about what she does, but I found my way over to her Etsy shops (beads and jewelry) and was stunned by her work. 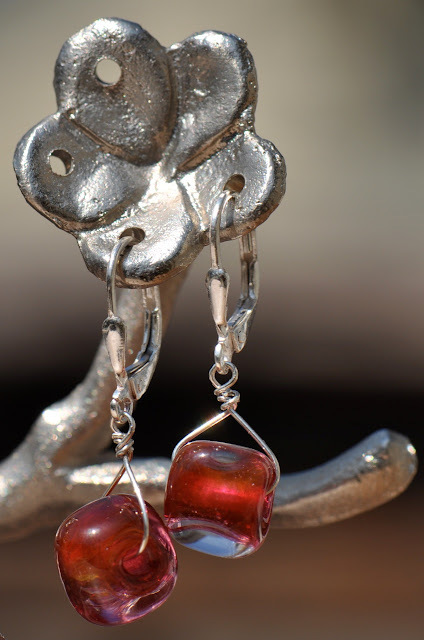 Kelley makes gorgeous glass beads in her garage! You really must watch this video of how she does it (scroll down the page a tad). Go ahead. Click over there and watch it and then come back. Isn't that amazing!? I was raving to Jamey about it and he just looked at me funny until I showed him the video. Then he understood my excitement. Well Kelley, the dear that she is, is giving away this beautiful pair of earrings (made with her lampwork beads) to one of my readers! To enter the giveaway, please visit Kelley's blog or one of her Etsy shops (linked above). Then come back and leave me a comment as to which bead or piece of jewelery is your absolute favorite. If you comment anonymously (which is absolutely fine), please leave an initial or two so I can identify you if you win. I (or one of my kids) will draw a name sometime this Friday and I will announce the winner then. And if you want to help get the word out about Kelley's work, you can blog about this giveaway and/or her blog and Etsy's shops. You won't earn any extra entries here but you'll be helping out a fellow reader and artist. Good luck and thank you, Kelley! My favorite is the Chocolate and Ice Lampwork bracelet. Thank you TH! I forgot to tell you that the earrings for your giveaway are all sterling silver. :) GOOD LUCK to everyone who enters! Those earrings are gorgeous! I'd love to win them (maybe that would give us the excuse to get together again--it's been a long time!). It was hard to choose one favorite, but I think the Ocean Floor lampwork focal bead would make a stunning pendant. Thanks for the giveaway. The earring are beautiful and I just loved checking out her beads. My absolute favorite is "mermaid seaweed". Did you know I had no idea what "Etsy" was until your last giveaway?! I'm having lots of fun checking out all the art & crafts! Lovely beads.... the African Queen bracelet is intriguing! WOW! Amazing and beautiful creations... I visited her jewelry shop and I love anything Bahamian Intrigue...so beautiful and colorful. How nice of her to give away such beautiful earrings...and now nice of YOU to give her a shout out! Generous ladies around here! Can't decide which I like best...the chocolate ice bracelet or forest jade necklace. These earrings are beautiful...hope I win! Lovely and loads of talent!! My favorite item is Amelia's Lampwork Necklace - gorgeous colors! I love The Retreat necklace! Awesome work Kelley! It's hard to pick, but I think the "Lavender Intrigue..."
Though Chad may beg to differ, one can never have too many earrings. I love the bold color contrast of the Holly Lampwork bracelet. Thanks. Sand and water lampwork bracelet is my favorite, although a favorite was hard to pick. Beautiful beads and work! my favorite is The Retreat - Forest Green lampwork necklace - Kelley Wenzel kelleysbeadstudio. I love those colors, although it was definitely hard to choose just 1 favorite. 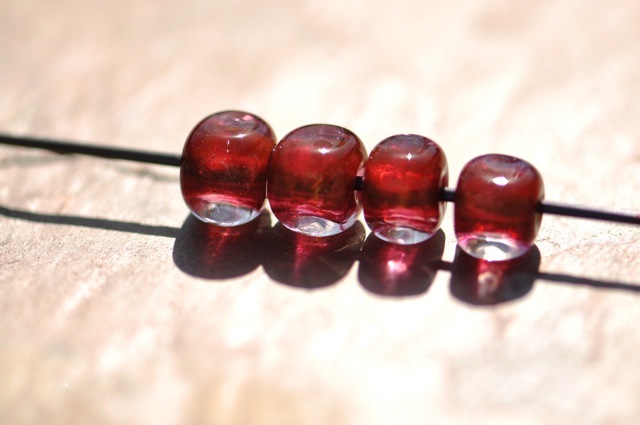 My favorite are the Raspberry Chiffon loose beads. I like pink. Wow- I love all the colors! The Raspberry Chiffon are my favorite and so pretty. I like the chocolate and ice lampwork bracelet. Making beads looks like fun! Great job Kelley! I LOVE Emily's Lampwork necklace. The red and pink beads are a great combo! p.s. I still owe you an email on the "100 friends" post. Sorry I've lurked without introduction yet. It will come! I really like Swirled Smoke Lampwork Focal bead. It's very pretty and seems like it would go with a lot of outfits that are more on the dresser side. :) The earrings are very pretty! Hope you are having a wonderful spring and thanks for the opportunity to play. I LOVE this: http://www.etsy.com/view_listing.php?listing_id=35368419. What beautiful stuff!! I love the jade forest necklace - the colors are very pretty!! You do beautiful work, Kelley! All those beads and the jewelry is gorgeous!! My fav, though, has to be the African Queen bracelet. It's just gorgeous! I should really get away from all the browns and neutrals, but I am so drawn to them time after time! How to choose?? All are so very lovely. I am drawn to the Mixed set of Etched Lampwork Nuggets. Very Nice. I love Amelia's Lampwork necklace. Beautiful! She is truly an artist. Thank you for doing the giveaway! I just love those earrings!!! She has a lot of unique beads... so pretty. I really think the Prairiescape Hollow Lampwork bead is gorgeous. What fun!! Blessings! Love your giveaway's! Even if I don't win! thanks for this intro to kelley's work! i absolutely love the amelia's lampwork necklace with the chartreuse and gold. she is incredibly talented! Wow, it's hard to choose a favorite. I am drawn to the Rainforest Lampwork necklace and the Holly Lampwork necklace. Two very different necklaces, but I like the inclusion of other beads/pendants with the glass beads, the curved lines in the Holly necklace, and the colors of both. Thanks for the introduction to Kelly's work! THE ONE I LIKE THE MOST IS THE JADE FOREST NECKLACE THE COLORS ARE SO BRIGHT AND THE COLORS COULD GO WITH ANYTHING. thank you for this lovely blog... I spent an hour or so just reading.. and today, after school, my 9 year old and I are going to make newspaper pots and plant seeds! Thank you!